Safety Hub and Heavy Duty Brake Drum Assembly for 1909-1925 wooden wheels. Includes a pair of NEW 10” outside diameter heavy duty emergency brake drums. These increase the braking surface of the drum. Also includes new lined brake shoes, part# 2566AQ. Excellent safety upgrade! The Ford rear axle transmits the weight load from the housings, through the axle shaft and onto the wheel hub. This causes severe strain on the axle shaft. These floating hubs transfer the weight from the axle housing directly to the wheel removing load strain on the shaft. The safety hubs replace the outer roller bearings and sleeves with reliable modern bearings. In the event of an axle breaking you won’t lose your wheel with these hubs! 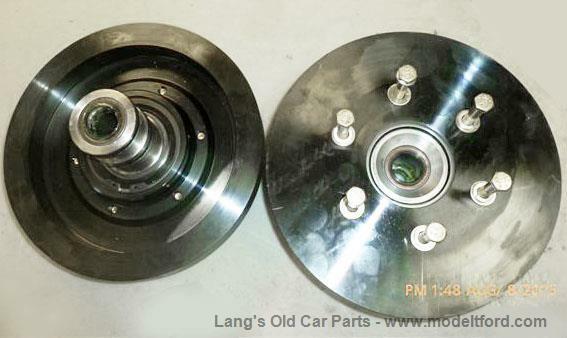 SPECIAL NOTE: To complete this new improved braking system add a part number 2566BEQ for 1909-1927 -AND- 2566EQRS for 1909-1919 or 2566BEQRS for 1920-1927. These parts allow you to also engage both your emergency brake and drum brake by using the brake pedal. A great improvement for a Model T.
The axle housing must be modified by cutting 1” off the outer tubing.